In 1988, Dr Barry Rose, OBE, best known for conducting the choir of St Paul’s Cathedral at the wedding of Charles, Prince of Wales and Diana, Princess of Wales, commissioned me to write a suite of four hymns for setting by the great Herbert Sumsion, composer of church music and Gloucester Cathedral’s Organist and Master of the Choristers from 1928 to 1967. For years I had sung Sumsion anthems and services. He was on a par with Elgar and Vaughan Williams. My reaction at the thought of writing for him is indescribable – but ‘awe-struck’ comes to mind. The next excitement came when he invited me to lunch to discuss the new work. I was virtually levitating. For the next few days my wife and family probably found me insufferable. I dreamed about Sumsion at night and thought about little else in the daytime. It so happened that I had already planned to stay with a friend who lived not far away from Rodborough Common, Sumsion’s Gloucestershire home, so I decided that the lunch date would fit perfectly at the end of that visit. The day dawned. 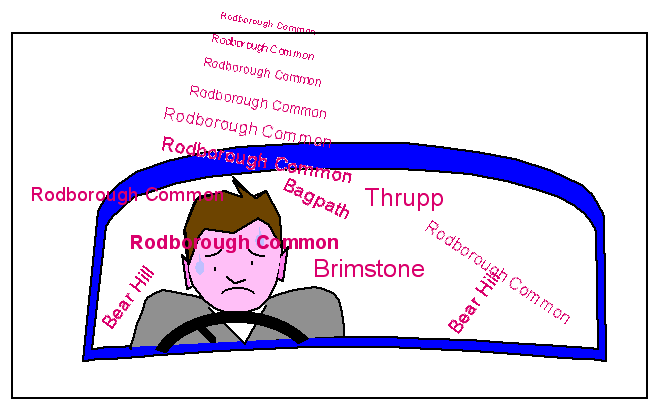 With a folder containing my first draft, but, essentially, without a map, I waved farewell to my friend and drove off to Rodborough Common, using the direct route. That is to say, down the lanes. Tracks, sometimes. I arrived at Rodborough Common without difficulty. But this, I found, is merely a district, with the occasional single rooftop visible through the trees. The similarly occasional signposts pointed to other villages; the Sumsions must live along one of them. Or perhaps on the border between two but, for the convenience of the Post Office, given the name of one of its neighbours. By the time I discovered the charming little house I was very late indeed. To the lady who opened the door to my knock I stumbled through apologies. With sweet pinkness of face, this gracious elderly couple actually apologised for having decided eventually to have their lunch and keep mine hot. I was to learn two things about Herbert: first, to friends and family his name was John and had been since he was five; ‘Herbert’ was used exclusively by newcomers. The second: these were the first hymn tunes he had ever written. With my draft on the music stand he spent time at the piano, playing over a few ideas and asking what I thought of them. We discussed the theme I had conceived for the suite: Morning, Noon, Evening and Night. He nodded vigorously as he read them. It is an encounter I shall never forget. Sadly, he never saw the publication of his work. They were published by Oecumuse but not until Autumn, 1995; he died the same year, on August 11. So the little work was not only the first of its kind by Herbert Sumsion; it became, almost certainly, the last. This entry was posted in Autobiographical, Church Music, Hymns and tagged awe-struck, Cathedral, Charles, church music, Diana, discuss, Dr Barry Rose, Elgar, Gloucester Cathedral, Gloucestershire, Herbert Sumsion, insufferable, lunch, Master of the Choristers, Oecumuse, Organist, Prince of Wales, Rodborough Common, St Paul's on 11/10/2010 by Paul.